Happy Thursday, Friends! Today I want to talk a little bit on what pieces of clothing enable you to get the most wear out of your closet. This has always been a huge help for me, especially during the spring and summer seasons, and it's a great way to keep you feeling (and looking) like you have a bunch of outfits! The answer to this is having multiple mix and match shorts and tops. Let's start with shorts. Build your wardrobe with several pairs of shorts that you love. I always tend to go for a few solid pairs (navy, white and a few fun colors), and I also add in some prints (both basic and whimsical). This is my current favorite pair of white shorts and this pair is my favorite navy pair. The J.Crew classic chino shorts (I love the four inch) are also a great option for your white shorts and also some fun colors, such as the kelly green. 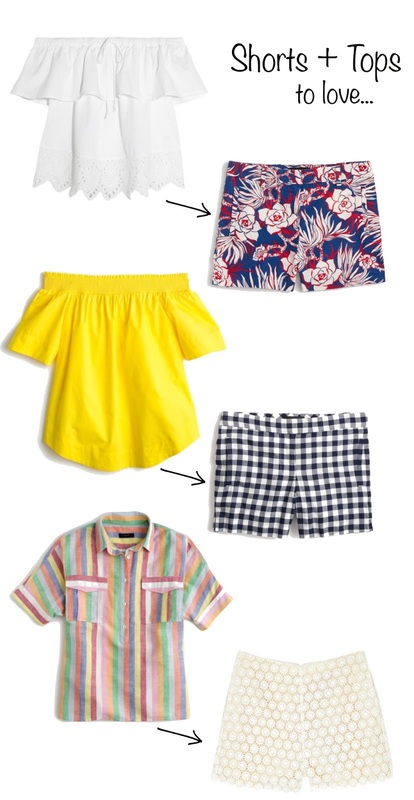 As far as prints go, I always look for a pair of gingham shorts because gingham is pretty much a basic, right? You would be surprised of all the cute things you can pair with gingham. J.Crew has an adorable pair out right now that I just received in the mail (40% off). They are so soft and super cute. Another adorable option is the Amber short in gingham (on sale for $69). I also love this printed pair! So, for a quick rundown, these are (and have been) my favorite style shorts that all run true to size. As for pairings, these are a few of my very favorites! And the best thing about these pairings is that you can mix and match all of these pieces. And then you can mix and match all three of these to get so much wear out of your pieces. It's also a great idea to have a pair of chambray shorts and a chambray top in your closet to pair with other pieces. And this is how I get the most wear out of what I buy, by purchasing pieces that all mix and match. I always feel like I can come up with a different pairing idea that makes me feel like I have a new outfit. See more of my favorite shorts and tops below!